Do You Have a Unique Situation on Your Property that You think Can't Be Fixed? An Experienced, Knowledgeable Restoration Company Can Provide a Solution! 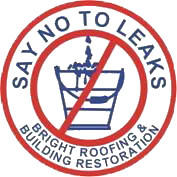 For Bright Roofing & Restoration, restoration is not just about restoring your building or pressure washing your sidewalk. At Bright, we have done some unique restoration for property managers and facilities managers that range from repairing a cracked sidewalk to taking a chimney stack down in size. Bright takes pride in creating unique solutions to any challenge a property manager or facilities manager may be faced with. When we asked our restoration customers if they could describe Bright Restoration services in one word, 98% of them said DIVERSITY. Diverse in what jobs we can do and the solutions that we provide. Industrial Siding—Not vinyl residential materials put on houses. Caulking—Bright stocks over 30 different caulks from manufacturer’s like Tremco, Sika, Vulkem, and Emaco. Why does Bright stock so many? Each caulking job requires a different caulk depending on the materials being caulked. You would not use the same caulk on a marble facade as you do on window glass. Graffiti Cleaning—Bright uses an environmentally safe material, instead of sand to blast away any unsightly stains on your building, like water stains, rust, and graffiti. Power Washing—Adjustable water pressure that avoids unwanted scarring. Exterior Façade Inspection—Bright will conduct a thorough inspection of the façade of your building to ensure the integrity of the structure.